Coffee, red wine, and candy are just some of the most common foods our Oregon City family dental patients eat every day that threaten the long-term health of their teeth and gums. While these commonly known culprits can wreak havoc on even the healthiest of smiles, they’re not the only foods we consume that cause problems. Here are a few surprising foods and drinks that can cause oral health problems that range from stains to plaque builds that increases the risk for tooth decay and gum disease. While the color can seem deceiving, white wines like pinot gris, chardonnay, Riesling, and others are highly acidic, and that acidity can slowly erode the hard outer layer of your teeth known as enamel, leaving it more susceptible to sensitivity and staining from other foods. If you don’t want to give up your nightly glass of wine, consider pairing it with a few bites of cheese. The calcium in cheese not only helps to strengthen tooth enamel, but it also helps to neutralize white wine’s acidity. While eating dried fruits certainly makes for a better snack when compared to candies, chips, and the like, they do present a risk to the health of your teeth. The reason? Fruits are loaded with fructose, a type of sugar. When fruit becomes dried, the concentrated sugars it contains become sticky, easily latching to the surface of your teeth and doing nearly as much damage as candy. 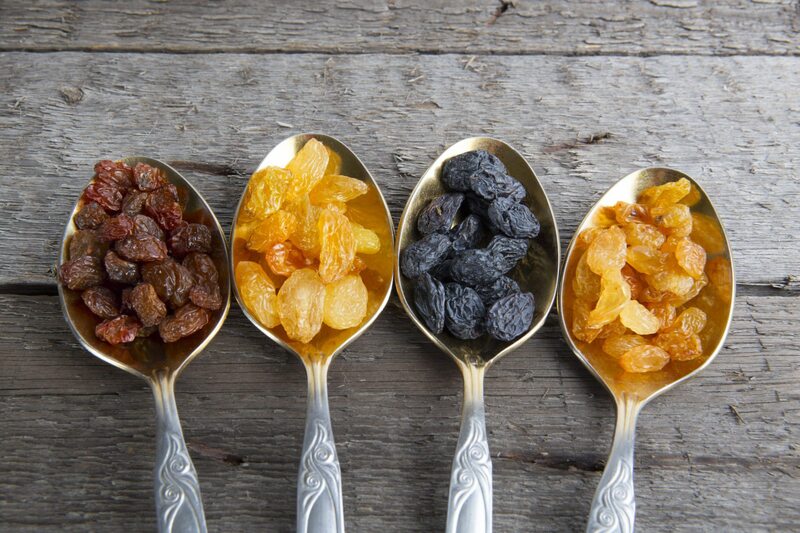 Raisins, cranberries, and apricots all fall into the category of fruits that could harm your oral health when dried. For a safer alternative, try snacking on nuts. Almonds, cashews, pistachios, and peanuts all contain little to no sugar and they’re full of protein, which will help you feel full for longer. If you think you’re doing your teeth and waistline a favor by enjoying sugar-free snacks or beverages, think again. A recent study conducted at the University of Melbourne discovered that some brands of sugar-free candy and drinks can cause just as much tooth decay as ones filled with sugar. The reason? The additives used to replace taste of sugar have acidic qualities that erode tooth enamel just as much as actual sugar. While a bag of chips might help to satisfy that afternoon snack attack, these type of crunchy foods can cause some serious problems for your oral health. When you chew chips, they break down into really tiny pieces that can be lodged and compacted into the crevices and grooves of your teeth. Potatoes are also a type of simple carbohydrate, which are broken down by the enzymes in saliva into simple sugars, making them nearly as problematic to your teeth as candy. While not exactly a food, most people have no problem with munching on the ice that remains in their glass. However, once again we find that a seemingly simple habit can actually hide potential problems. Chewing ice places a lot of stress on your teeth causing wear. Considering ice’s temperature, this stress occurs when tooth enamel is already at a weakened state that to the cold. The colder something becomes, the more brittle it becomes. Put these factors together and you could easily chip or crack a tooth the next time you chomp on some ice. For our Oregon City family dental patients, the best practices for protecting your oral health include avoiding the foods and drinks that can damage your teeth. However, if you just can’t say no to your favorites, minimize the damage by trying these handy tips. Don’t nurse drinks. The longer sugary or acidic beverages stay in contact with your teeth, the more damage they can cause. While you may feel like savoring ever sips of your favorite cola or fruit drink during a hot summer’s day, it’s best that you finish these types of beverages quickly, ideally during a meal. Chew sugarless gum. Chewing gum helps to stimulate your mouth into producing more saliva, the body’s natural defense mechanism against sugar and oral bacteria that damage tooth enamel. By chewing gum after meals, you can enable the mouth to better rid itself of any sugars or food particles that remain after eating.